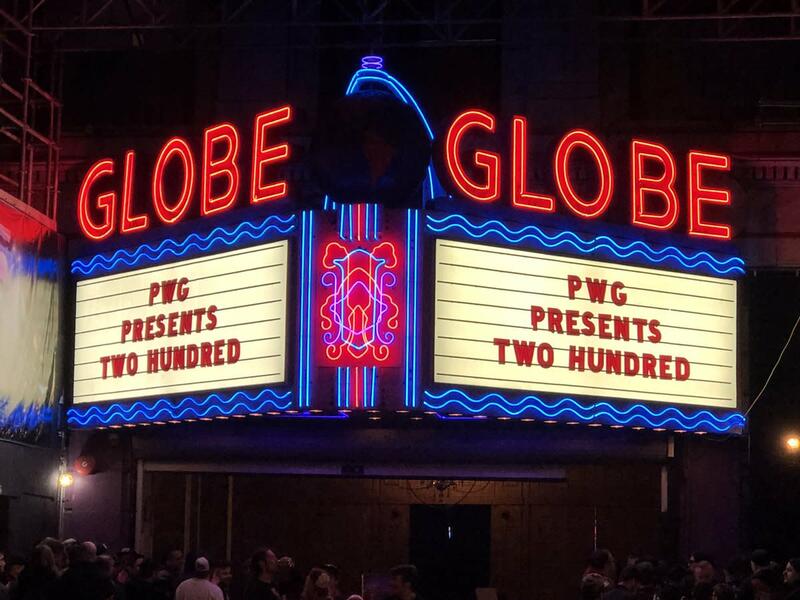 Here are results from last night's PWG Two Hundred show at the Globe Theatre in Los Angeles. Really good stuff. A little too synchronized at times but creative as hell. Miguel is really good and Atlas has improved a ton in the last several months. Jungle Boy pinned Miguel. Jungle Boy was really popular and I was surprised to see him there given his father suffering a stroke two days ago. He just has the ability to get over with a crowd. Excellent Lucha match. There were tons of moves and dives with a lot of creativity. It's just what this crowd wanted from this match. Laredo Kid was great here, kind of doing so much stuff because he was losing. Long match. Some really good stuff, a few misses. Basic tag stuff. They worked hard and went long. While making a comeback, Davis did a spot where he went to bodyslam both at the same time and lost them. But there was a lot of good stuff in this one and it was more psychology based than the first bouts. Great for what it was. A big bruiser type and a smaller guy selling great for him. Allin got his mouth busted open. He took some insane bumps being thrown around, and he did two backwards dives like Kofi Kingston, including one off the balcony. This was a technical match that got more wide open with big moves later. A lot of people saw this as the best match. It was different from everything else because of the level of modern technical skill and -- while there was flying late -- it built to it. Gresham is one of the most underrated guys in the business and Starr was great working in that style. Fenix was pinned by Xavier. These guys went out like it was hell on wheels with nothing but big moves. The creativity was awesome and the execution was mostly good with a few exceptions. But the ending came out of nowhere. It was patterned to look like a save was coming and it was too slow and the ref counted to three. It was also shorter than expected, but the first nine minutes were incredible. Cobb retained with the Tour of the Islands. There was a lot of really good stuff here as well, but unfortunately these two had such an incredible match at BOLA, and following the craziness of the tag match, the crowd only went nuts for it in spots. This was excellent and on another show people would be raving about it like it was a classic. The most memorable spot was Cobb coming off the top with a crossbody and Bandido catching him and powerslamming him. I also think people badly wanted a title change and they never got them biting on that happening.